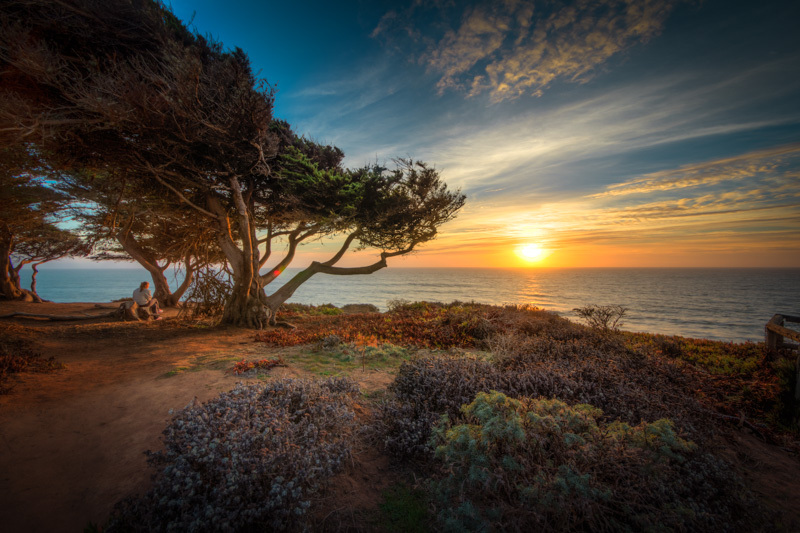 The featured photo of the sunset at Moonstone Beach in California was one of the most popular photos on this blog in the last 12 months. I also was asked on many occasions about the process of shooting and editing this particular shot. 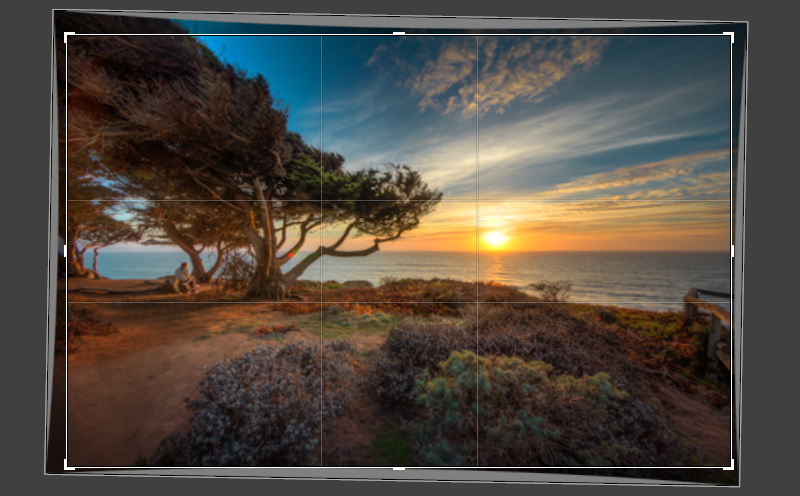 I decided to put together step by step visual guide of my typical HDR workflow when I use Photomatix to merge multiple photos to HDR. This is where I normally stay for the night. I plan my schedule so I can check in to the motel an hour before the sunset, and then I take only my tripod and camera and walk along Moonstone Drive in the sunset hours. 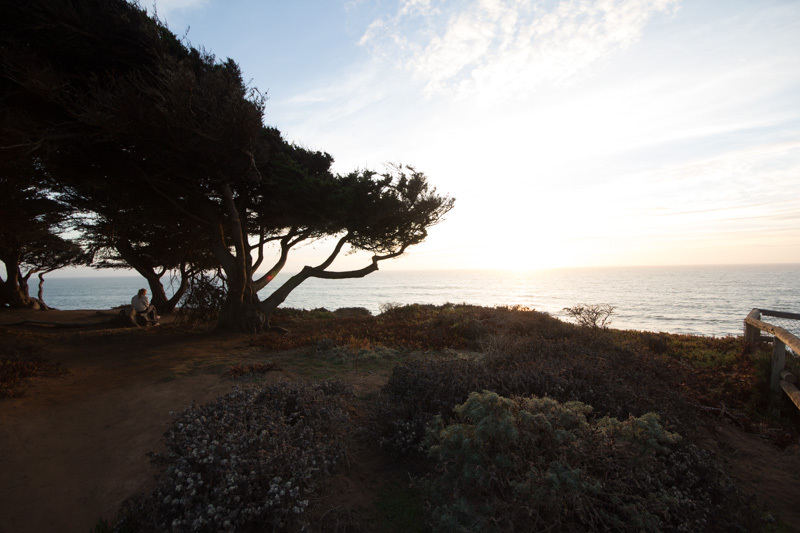 This spot serves as the final point of my travel photography sunset hike, and where I stay until the sun completely submerges into the ocean. 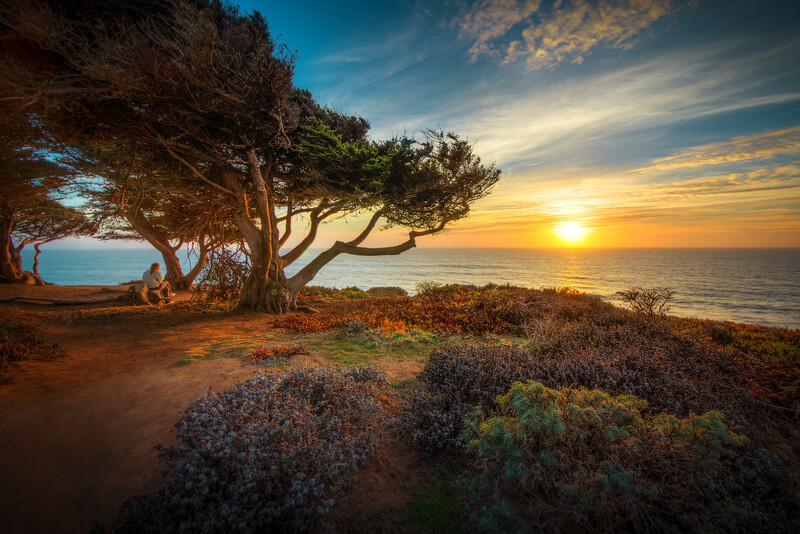 This is the ultimate location for HDR Photography; shooting into the sun as it is setting into the ocean, with some colorful textures in the foreground. This is when HDR shines. The shooting part was easy. First, I made sure I had an interesting composition and then I took 5 bracketed shots on a tripod with 1EV intervals (-2; -1, 0, +1, +2). 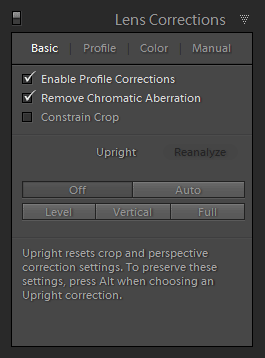 After I imported 5 bracketed images into Lightroom, I applied only 2 edits to all of them: Lens Profile Correction and Remove Chromatic Aberration in the Lens Correction Panel. I selected 5 bracketed shots in Lightroom and using command Export > Photomatix Pro, I sent them to Photomatix. Here is the result of processing 5 images in Photomatix compared to the middle bracket. When I brought newly created HDR image back to Lightroom I could see 2 main issues; the horizon was not straight and the shadows were still too dark. 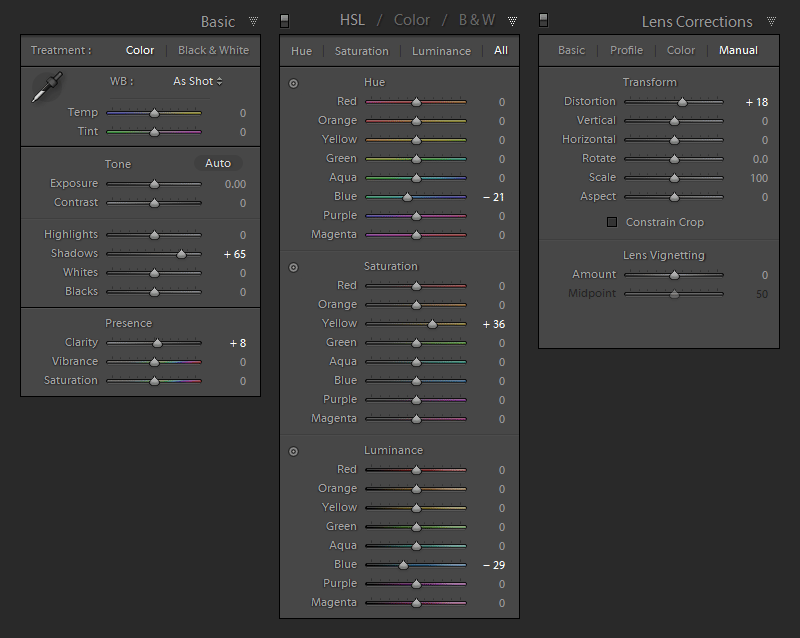 Below is the screenshot of all edits I performed in Lightroom. I used the combination of the Crop & Straighten and the Lens Correction tools to make sure the horizon was straight and perfectly horizontal. In Photoshop, I started with the cleaning. Using the Stam Tool I removed all distracting elements and removed (covered) lens flare on tree branches. I used Topaz Detail plugin to emphasize the textures in the foreground elements (path, bushes, trees). I used Topaz DeNoise to reduce digital noise in the area of the sky and the water. I cropped image again, making the composition even tighter. In the end, I used the Curves tool to add vignetting and the Vibrance tool to emphasize the colors. Photomatix: I used 5 images to tone map image (-2; -1, 0, +1, +2), 16-bit tiff image was exported to Lightroom. Lightroom: straightening, cropping, export to Photoshop. Beautiful photo. Thankyou for showing us how you improved it. Thank you for sharing the process on how to arrive at the final product. By the way great picture. Thanks so much. 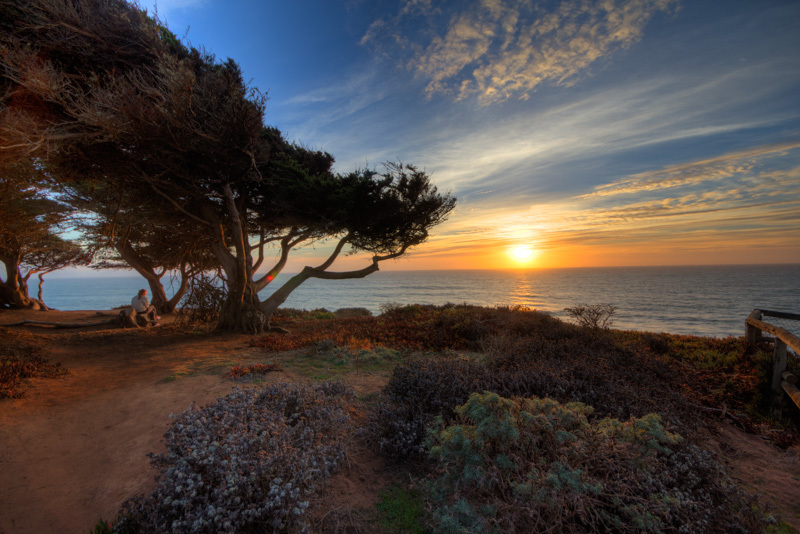 I have walked Moonstone at sunset, marveling at the bent cypress and the way the sun melts into the sea. Tried for a great photo with my Canon 40D. Now you’ve given me technique to go back to those photos and see if a spectacular shot can be coaxed out of hiding. How nice of you. Thank you for the detailed description, Viktor. I have those three programs as well and your guide is perfect for me to “look over shoulders” to see how a pro tackles the shot! One question: I see you set your own Photomatix settings. Do you use any of the presets often as a starting point? Is that the one shown in your blog post? what you see is the modified settings of my default template. The template I use is pretty neutral and I use it as the starting point for my edits. Thanks. I’ll have to look at Topaz DeNoise. How did you get the 60D to bracket 5 shots? It only has a setting for 3 bracketed exposures. 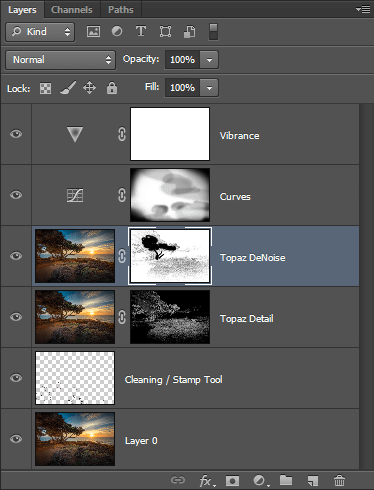 I have tried almost all Topaz plug-ins but have found them mostly disappointing. In short, Topaz DeNoise gives almost plastic look to the images (images appear almost like oil paintings) and all other plug-ins produce terrible noise. I find Adobe Lightroom more useful in removing noise without adversly affecting the quality of images. Of course, every to his own. But I must admit you have taken great pains in describing your work flow. Shows your sincerity. Regards. I do not agree with you about Topaz Denoise and Lightroom. I find that Lightroom cannot detect patterns and apply the noise reduction to the entire image. In case of DeNoise, it is much smarter, it only applies the reduction to flat areas (sky, water) and disregards elements with the details (rocks, trees). I hardly use Lightroom noise reduction functionality at all. Since noise in any image is not restricted only to flat areas and is found all over the image, what is the harm if noise reduction is applied to the entire image like Lightroom?